Check back here for updates, information, and pictures leading up to our big day on May 30, 2015. Travel for the wedding: you have options! Drew and I have been gathering all the materials to create our invitations, and we're happy to say that they will be coming your way next week! With invitations, of course, come travel plans! Flying into CEDAR RAPIDS is still the most efficient one in terms of location and time. Luckily, flying into Chicago is a great affordable option as well! It's a straight shot drive to Iowa City - only taking around 3 1/2 hours. Trust me - the Cecil family has done this drive plenty of times! 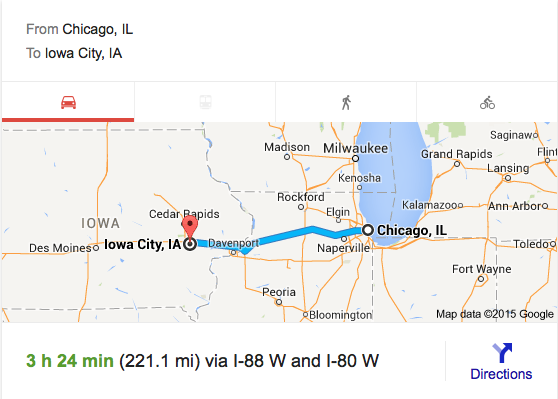 Also, Moline/Quad Cities is an option as well, being only an hour away from Iowa City. So if you're thinking - "Oh crap, this flight into Cedar Rapids is a little pricey!" - keep Chicago or Moline and an easy car rental in mind. You could even plan with a few friends and make a little mini road trip of it. Less than four months away now!